I'm doing a group mentorship with David Romanelli, the Livin' in the Moment: wine, yoga and chocolate guy. 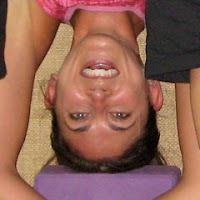 It's very innovative concept in the yoga world, group yoga mentoring at home, at my convenience. He's challenging us to find a Delicious, Funny or Beautiful moment on a daily basis and to post it on his own networked site he created, Oasis. I'm trying not to take more than a few minutes a day to do this... hum... Here's the thing: when I do something, I'm all in. ALL in. My best. And, I wear my heart of my sleeve. So how can I not put more than a few minutes into this or anything else I do? Seriously? Maybe I need a dose of humble pie (can I have that in chocolate, dave? ), but I hope I currently soak in the amazing and not so amazing moments of life. (Weeks in India without kids, yoga trainings, picnics with Drew, impromptu dancin in the house with the boys, coffee with friends, stop to write a card to a friend...) I think I live in the moment most of the time. Most of the time. When I'm not in a rush or late for carpool... why am I always late for carpool? (note to self: need to leave 10 minutes earlier. setting watch 10 minutes early did not help.) I could do more smelling the roses and stopping to listen, really listen to my kiddos or watch the ducks cross the road... more enjoying the moment. Perhaps I could. When I think of mentorship, I think about accountability, encouragement, intellectual and spiritual growth, guidance to go further than I thought I could because someone else thought I could. And Svadhyaya: study. I will be forever a student. A challenged, often remedial one at that! But always a student. I have so much to learn. From the wine-chocolate-yoga guy to my selfless restorative yoga mentor, Leeann Carey to Ajit's beautiful mother I met in Delhi who does yoga and pranayama 5 days a week and appears to have more lung capacity than and limberness than those half her age. I have so much to learn, and I'm eager. Hungry even for what I don't yet know. It's opportunities like these, learning from those who go before me, that I make me happy. Thank God, Jefferson had the sense to change the Declaration from property to happiness. Can you imagine a nation founded on the pursuit of property? It might feel like we are like that at times but the essence of our legacy and the freedoms (spiritual, mental, and otherwise) intended is key to the foundation of our lives today. Happiness for me is the pursuit of knowledge and the ability to pass it on in a way that is received in love. What's your Delicious, Funny or Beautiful moment this week? * Book: "And the Pursuit of Happiness" by Maria Kalman, makes me smile- flows from random thought to thought and illustrations are enviable. Actually, I prefer her first book, The Principals of Uncertainty.